Looking good, despite the temperatures in the high 20s. Right, we’ll take it as read that it’s too damn hot and drier than a teetotaller’s liquor cabinet. Otherwise, things aren’t looking too bad down on Plot #59. As long as we can keep on top of the irrigation requirements, we ought to be able to keep everything alive long enough for the temperatures to dip again to a point where the plants can be happy again. Our onion patch is doing fine, despite the heat. 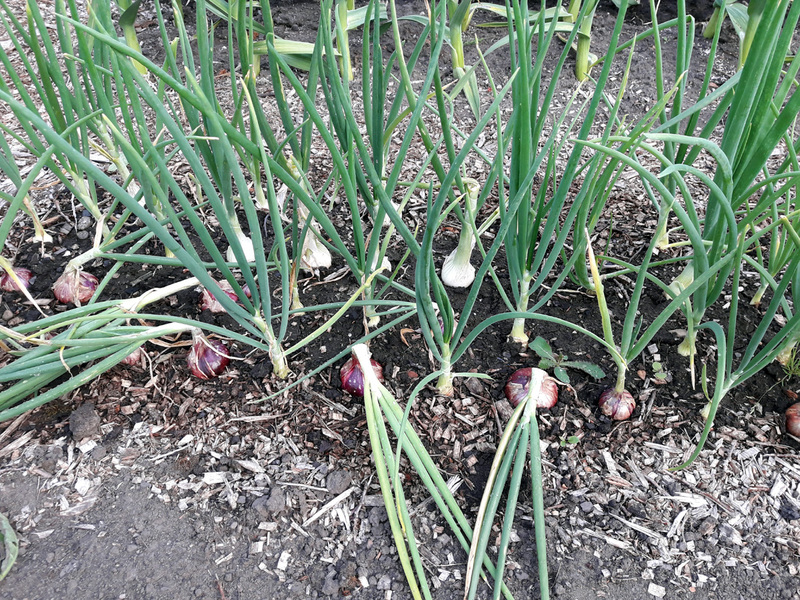 The red onions are autumn-planted sets, and they’re quite a bit larger than the white onions, which are spring-planted sets. A few of the whites tried to bolt, but I’ve been keeping up with the watering and so far most of them have behaved themselves. Another couple of weeks and I’ll be lifting them to dry and store. 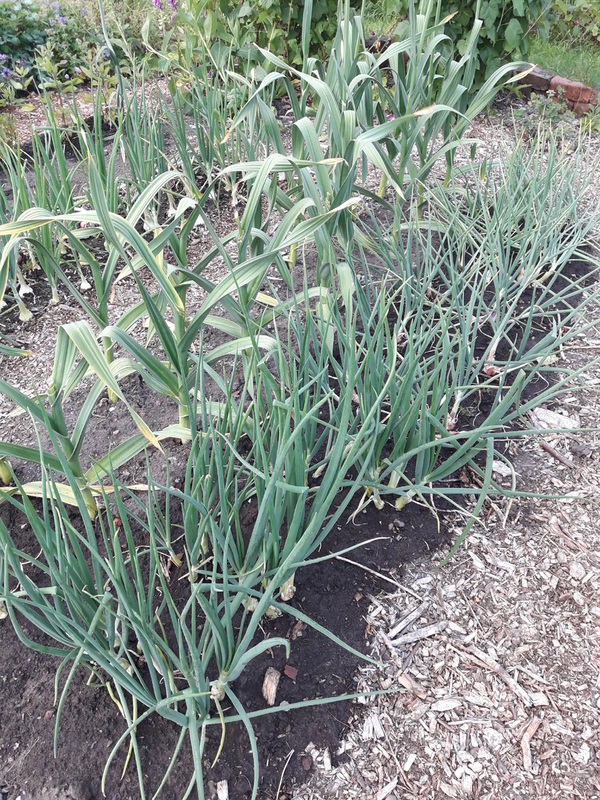 This is a mixed patch of shallots, elephant garlic and cluster-planted white onions. I can never remember whether you’re supposed to remove the elephant garlic scapes or not so this year I’ve gone half-and-half. I’ll compare bulb-size when I lift them to see if there’s any noticeable effect. And this is our newly-dibbed leek bed. Two varities this year: ‘Pandora’ and ‘Elefant’. I did grow a tray of ‘Musselburgh’ seedlings as well, but I’ve donated those to the allotment plot at work, to make up for a poor germination result this year. 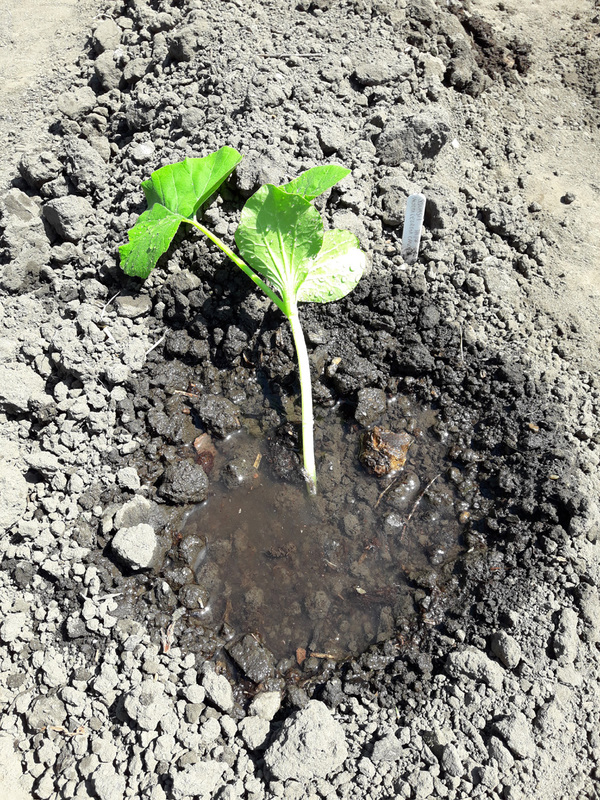 I think I’ve finally got the hang of courgette (summer squash) plant spacing. After a few years of crowded, sprawling, lanky stems, this year’s plants – a good two feet apart – seem to be growing in nice, neat, large clusters of foliage. First harvest tomorrow, all being well. Likewise trailing squash. This year I’ve created soil ridges around three metres in length and have planted a single squash plant at either end. Each is mounded around with soil to create a water reservoir, meaning I can soak each plant knowing the water will go right to the roots, where it’s needed most. As they grow, they’ll trail along the top of the ridge and can be tied in to short cane pegs if needed. Varieties planted (so far): ‘Blue Hungarian’, ‘Australian Butter’, ‘Crown Prince’, ‘Rouge Vif d’Etemps’, ‘North Georgia Candy Roaster’ and ‘Knucklehead’. 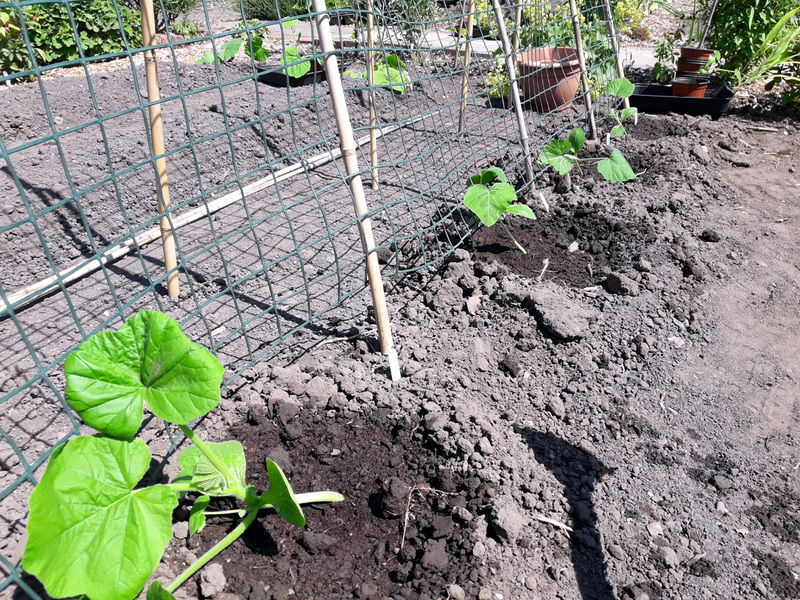 I’m also growing a few climbing squash up plastic mesh supported by canes: three ‘Black Futsu’ and one ‘Uchiki Kuri’. This years I’m growing the James Wong recommended ‘Mirai White F1’. They’ve been in the ground since the start of June and seem to be thriving so far. 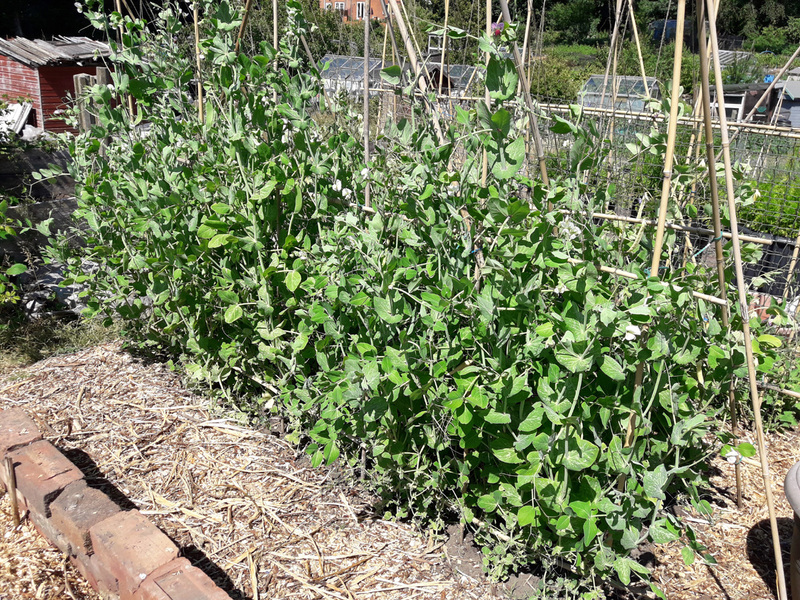 Jo and I built the usual pea-harp growing frame and planted out two rows of maincrop (‘Telephone’ and ‘Carlin’, above) and two rows of mangetout (below) in the middle of May. The plants have been growing strongly ever since and the mangetout have just started cropping this past week. Fresh, crunchy, tasty, a lovely addition to any salad. You might just be able to pick out some of the pods in the picture above. We’re growing yellow ‘Golden Sweet’ and purple ‘Shiraz’ again. The yellows are a bit more vigorous than the purples, so you end up with a rather lovely split level colour effect. And lots of tasty pods, of course. I’m also growing ‘Timperley Wonder’ in large square tubs at home. They’re podding up nicely, but I’m seed-saving them for Garden Organic’s Heritage Seed Library, so they ain’t for eating (not this year, at least). The one good thing about all this hot, dry weather is it’s kept the blight -which thrives in warm and damp conditions – under control. 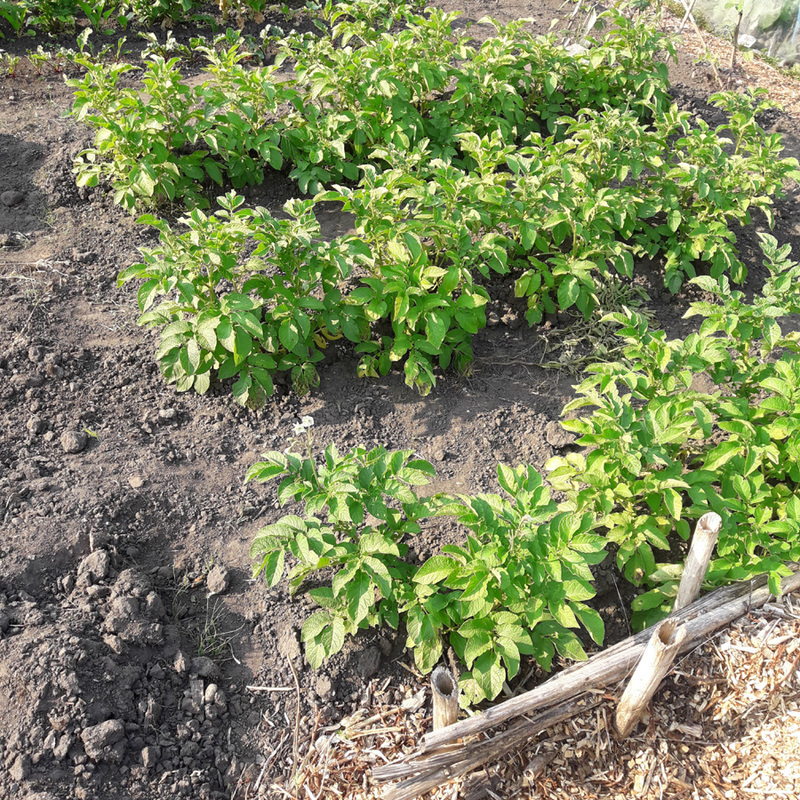 Normally on our site it’s a race to get your spuds in and cropping as early as possible, before the inevitable pestilence descends and you end up cutting back the haulms and hoping for the best, any time from mid-June onwards. Two years ago I was cutting back on July 1st and I think last year was even earlier than that. However, there is a down-side. Without moisture to swell the tubers, this year’s yield is likely to be poor. Above is the total harvest from two plants that I dug up a week or so back. Not exactly spectacular. I finally caved yesterday and gave the potato plants a drink – watering without a rose on the can, pouring very carefully to the base of each plant so as to avoid splashing the foliage – which will hopefully help a little. I’ll leave them another week, then see what’s what. 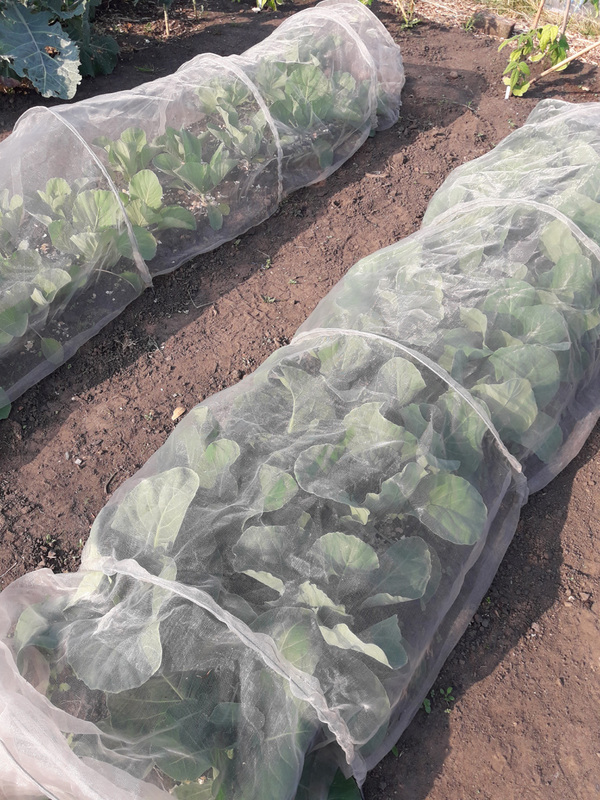 We planted out a couple of rows of early cabbage – ‘Golden Acre’ and ‘Jersey Wakefield’ – under mesh tunnel protection and they seem to be doing just fine. Likewise a row of six ‘Brendan F1’ Brussels sprout plants, which are already shoving their tunnel up and off as they reach fro the sky. 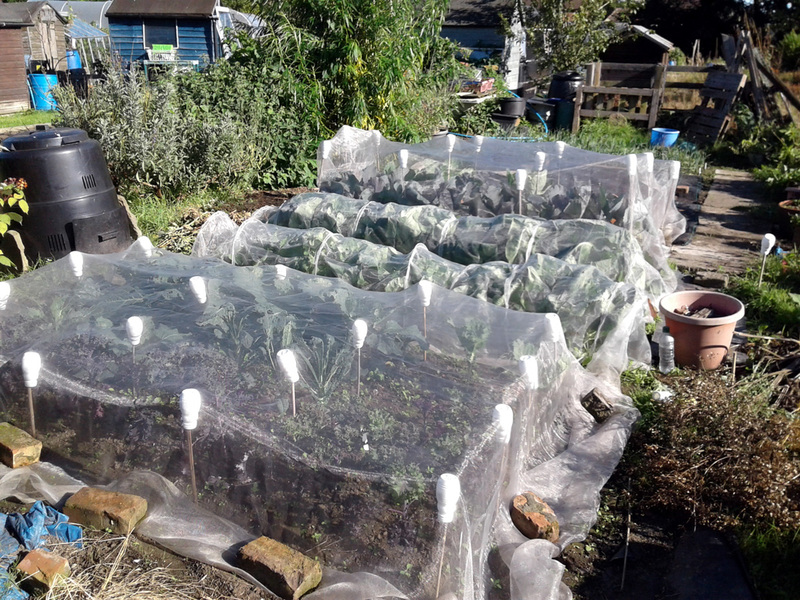 I ‘ll have to switch to an enviromesh cover for those soon, to try to keep the cabbage white larvae off ’em. And just to show what hardy plants cabbages are, the above is a row of savoy cabbage that I planted out in Autumn 2017. I’ve been picking leaves from them to use as spring greens for weeks now, and apart from a downpour a few weeks ago, they’re not under any sort of protection and haven’t been watered since the last regular rain we had back in April, but they keep on growing. They also make good decoys for the cabbage white, keeping them off the younger plants, with any luck. The one section of the plot not too badly affected by the lack of water is the soft fruit plantation. 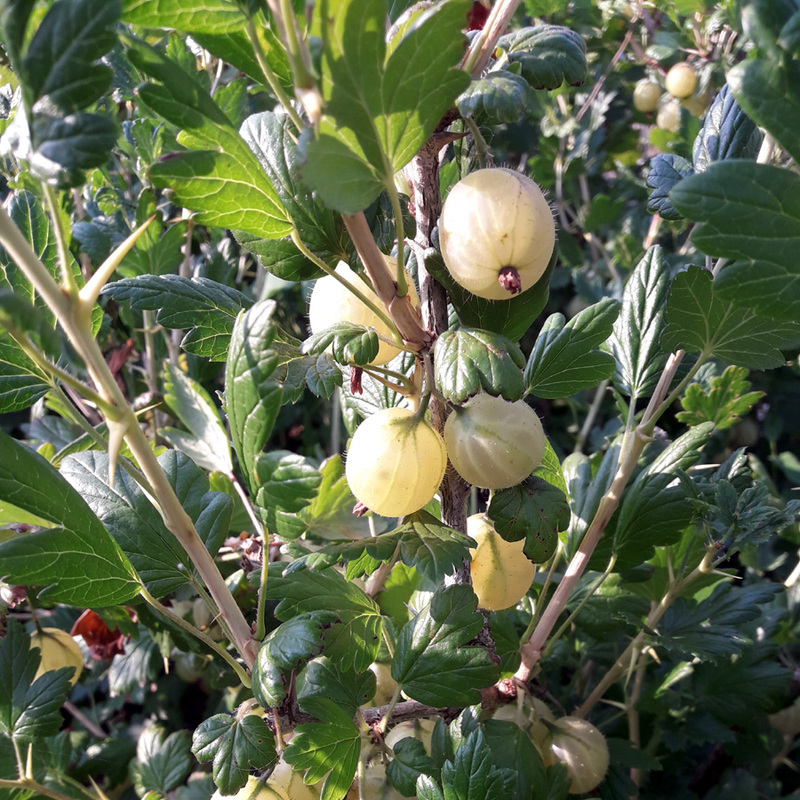 Our two large and one massive gooseberry bushes have put on kilos and kilos of fruit; we’re struggling to pick, wash and freeze it quickly enough. Delicious they are, too, soft and sharp-sweet, right off the bush. Our blackcurrants have been typically prolific this year. The currants are smaller than they have been in past years, but that seems to have concentrated the flavour. I’m freezing those as well and am looking forward to making blackcurrant jam – the king of jams – when things have calmed down a bit. 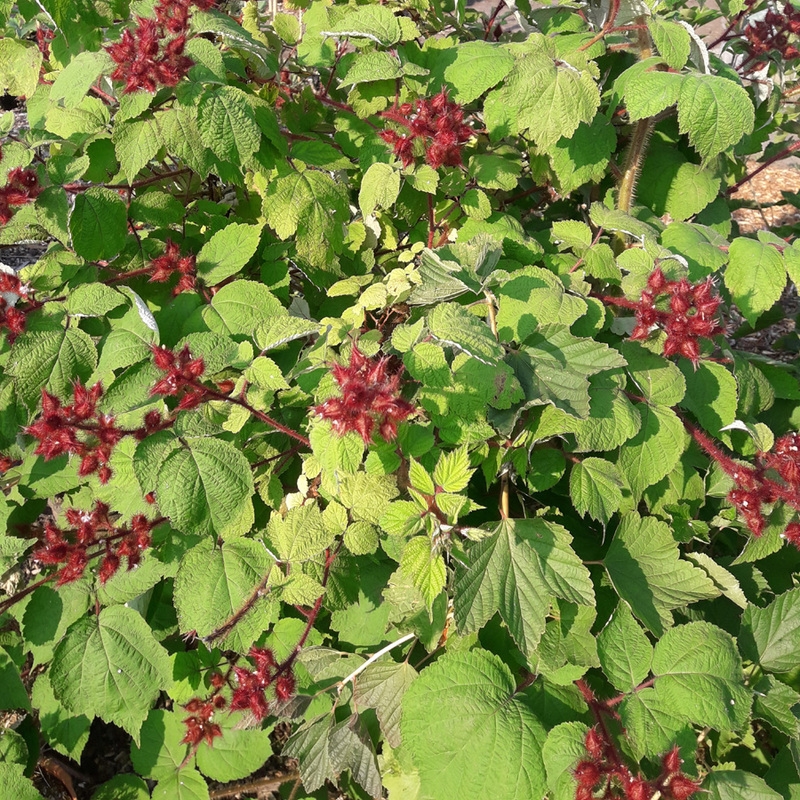 Our Japanese Wineberry plant has grown massively this year – its third on-site – and looks set to produce a glut of fruit in the next few weeks. If you haven’t tried the fruit from this prickly monster it’s well worth tracking down. Raspberry-like, but with a winegum sweetness. Incredibly easy to pick as well. When ripe the berries almost fall off the bush as soon as you look at them. Also waiting in the wings: redcurrants (not quite ripe yet), whitecurrants (hard to tell, but likewise not quite done, I think) and raspberries. I made time to thin the canes properly a week or so ago, so hopefully they’ll be much easier to harvest than they were last year. Well, that’s it for now. If you’ve posted a similar plot update recently, or just want to let me know how your own plot is coming along, leave a link in the comments below and I’ll take a look-see. 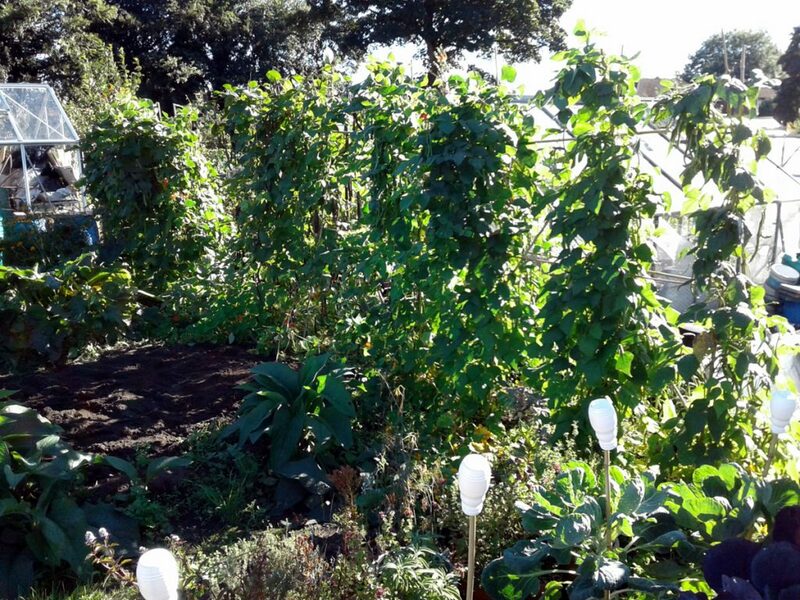 A year has rolled on by since I posted the first Year in Review piece here on Notes From the Allotment, and a lot has changed down on Plot #59. 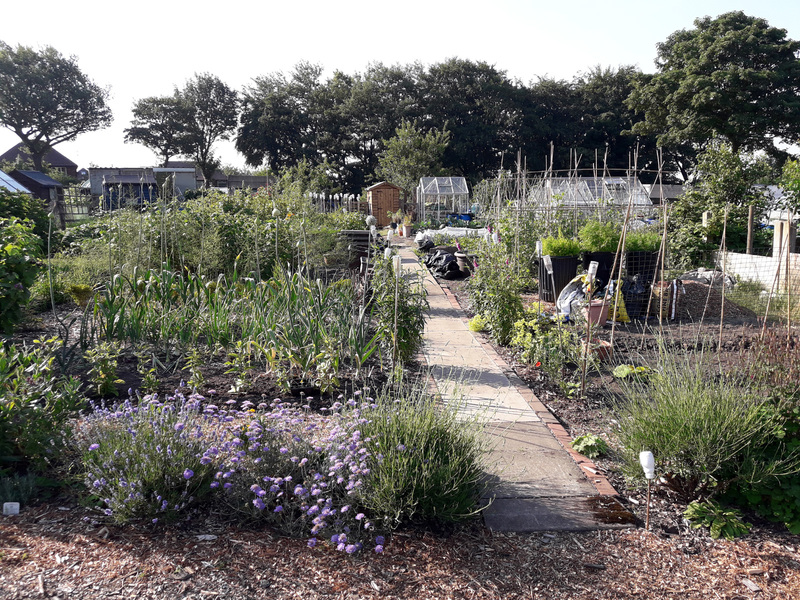 After three years of hard graft, we’ve finally reached the point where almost the entire plot has been transformed from a weed-choked, debris-strewn nightmare into a usable, cultivated growing space. There’s still one small area of midden-ground that I’ll be clearing later this year, and a problem section or two at the back. Once those are tackled though, Jo and I can draw a line under phase one (disaster response) and get on with the serious business of full-scale growing. Last year we grew a stupid amount of beans – we’re still eating through the freezer stocks of blanched pods, and have a couple of kilos of dried beans that we probably won’t get around to using, unless we get a lot more creative – and it was great. As well as the traditional ‘Scarlet Emperor’ runners and ‘Fasold’ climbing French, we tried a couple of new-to-us varieties, the best of which had to be the ‘Blackpod’ cultivar that we received through our Heritage Seed Library membership. Very tasty when young and still in the green, maturing into deep, burgundy pods filled with purple-black beans, they were a visual feast and a delicious accompaniment to many a pork chop. The very lovely deep purple colour of these pods is just superb. We also had a good year for broad beans, with Spring-grown ‘The Sutton’ and ‘Red Epicure’ providing us with a rainbow of colours. 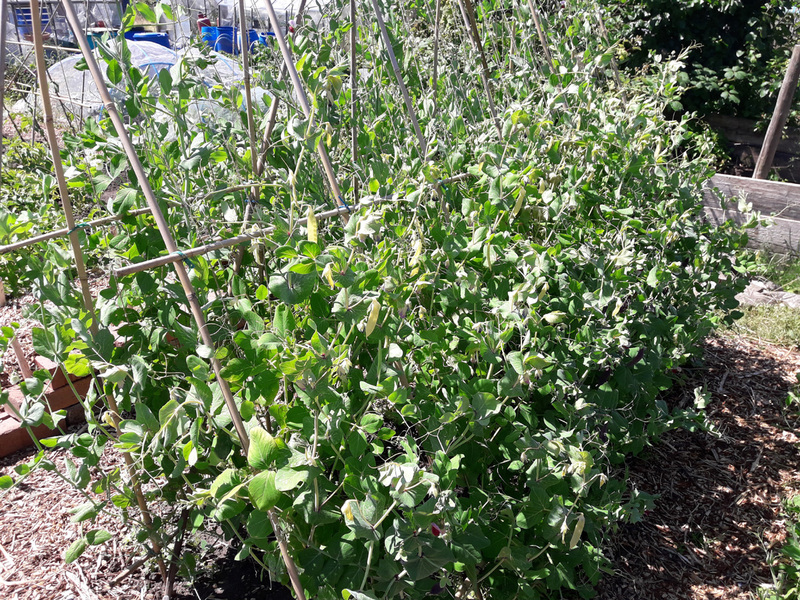 And the mangetout peas ‘Shiraz’ and ‘Golden Sweet’ grew like crazy up the pea-harp that we constructed for them, and provided us with fresh, sweet pods for weeks and weeks. We’ll be growing both varieties again this year, along with a couple from the Heritage Seed Library. Turk’s Turban and Tondo ahoy! The sweetcorn performed well again last year. It seems to like the spot we grow it in – at the front of the plot, in full sun (when the sun is out) – and we ended up with another good haul of sweet, juicy cobs. This year we’re trying a heritage variety called ‘Rainbow Sweet Inca’ which promises multi-coloured kernels. Sounds like good fun. Our over-wintered garlic did very well indeed. We harvested a good dozen or so large bulbs of ‘Elephant’ garlic around 30-40 of the ‘Extra Early Wight’ and ‘Carcassonne Wight’, although the latter’s bulbs were a little on the small side. Properly dried and stored, these giant Elephant bulbs will last us well into next Spring. A good year for onions, with around 80 of assorted sizes from the ‘Sturon’ sets that we started off in modules before planting out. They kept well in an old dresser drawer in the shed and had a good, strong-flavour to them. Same again this year. The leeks went in rather late, at the tail-end of August rather than in June, so they didn’t get much growing done before winter set in. 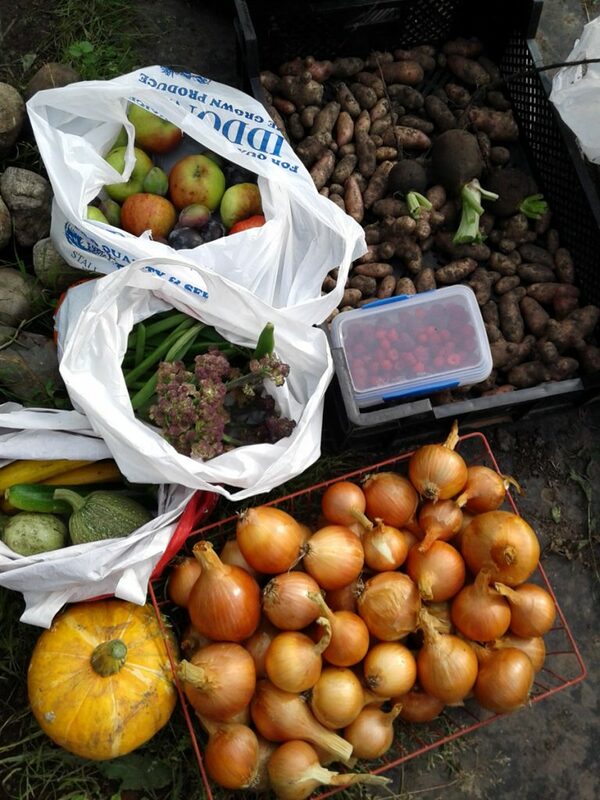 We’ve been happily harvesting every other one for the past few months though and they’ve been very enjoyable indeed. The last few dozen are starting to put on new growth now, thickening up a treat. We may even end up with some decent-sized specimens before we need to clear the patch for this year’s courgettes. Lots and lots of lovely leeks. Alas, we suffered from a double-dose of potato disease last year. 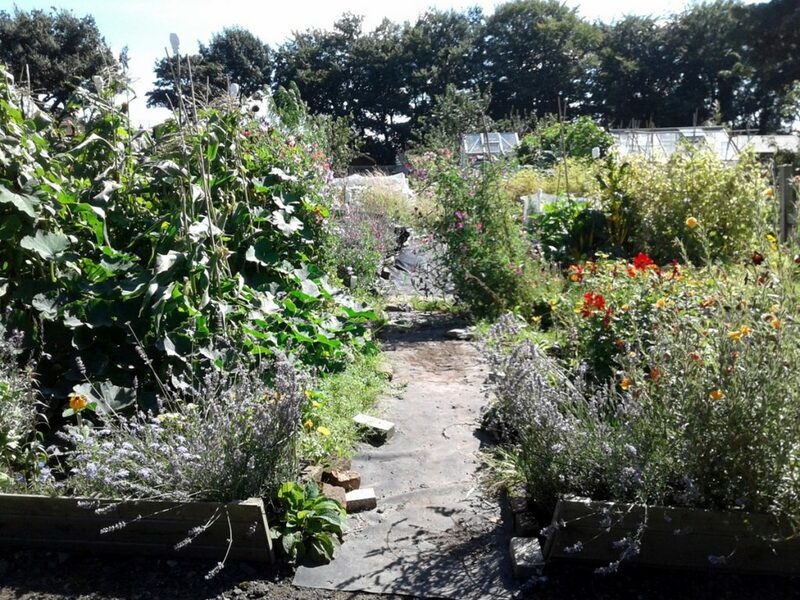 Our first earlies were hit by potato leaf-roll virus which killed off about half the plants, and then a rather vicious attack of early blight ripped through our allotment site back in late June and early July. That meant the haulms had to be removed before the tubers had reached their maximum potential, and cropping was affected as a result. We still managed to harvest a decent haul of ‘Pink Fir Apple’ and ‘Saxon’ but nothing like 2015/16’s enormous piles of tubers. This year I’m sticking to Saxon and crossing my fingers that we have a drier spring. Same story with the tomatoes, alas. We didn’t actually grow any down the plot, they were all in the back garden at home, where we’d hoped they’d be isolated from blight. But we must have brought some spores back with us from somewhere, because it took hold and destroyed the lot. We didn’t get so much as a single usable green tomato… one more try this year, and then we’ll have to decide whether they’re worth the inevitable disappointment. It was another great year for blackcurrants, rhubarb (I know, technically a veg stem, but if it goes in a crumble it gets a mention here) and raspberries, with kilos and kilos of fruit filling up the freezer, or being turned into delicious jam. We also enjoyed our first really good crops of gooseberries and redcurrants. Our potted blueberries did okay, but they were re-potted earlier in the year, so we thought they might rest up and recover a bit. How’s this for a berry selection? By no means the entire crop, either. The real discovery though was the Japenese Wineberry. The fruit of this spiny, long-stemmed bush is small, bright red, and slightly tacky to the touch. 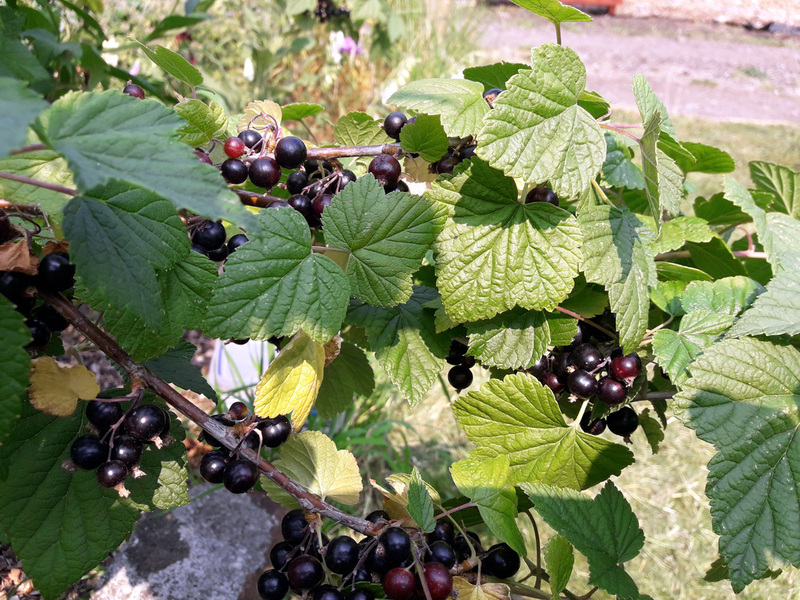 When the berries are ripe they come away from the bush with the slightest encouragement and taste like slightly tart wine-gums. They don’t keep all that well, which means you have to eat ’em up quick – a terrible shame, that – but they’re great in a summer fruit salad. This year we’re going to try to increase our stock by layering in a couple of branches. These wineberries are something of a taste revelation – a lovely balance of sweet and sharp. The one disappointment was our strawberry patch. We did have a reasonable crop back in June, but we lost a hell of a lot more to botrytis grey mould, which ripped through the tightly-packed plants in May and destroyed most of the early fruit. The plan this year is to thin out every other plant and then keep on top of trimming back foliage to increase ventilation. Then at the end of the year we’ll probably re-plant the whole section with brand new stock. We did have a pretty good year for roots of other types though: mooli and black radish, scorzonera and salsify all grew well and were tasty additions to our baked root veg dishes. We also tried root parsley, but it didn’t really get going. We’ll give that one more go this year on the off-chance we were just unlucky. Carrots, salsify, scorzonera and mooli. We went big on brassicas this past year, planting out four varieties of Brussels sprout, purple cauliflower, romanesco cauliflower, calabrese, red cabbage, green cabbage, savoy cabbage, green kale, red kale, and walking stick kale. The best performers were the cabbages, which grew strongly despite a late planting and we’re still finishing off the last few red and savoy. The worst were the romanesco, which bolted again, and Brussels sprouts, of which only one variety (Rubine) produced anything decent-sized enough to eat. We’ll try sprouts again this year, and get them in a bit earlier, see if that helps. The walking stick kale was an interesting novelty, growing to around 6′ in height with huge leaves, but those leaves were pretty tough and leathery. They did cook down, if you fried them for long enough, but the flavour wasn’t so spectacular that we’d rush to grow them again. Not when smaller varieties of kale are generally tastier, and more manageable too. As for drying the stems to use as plant supports or even walking sticks, we’re giving one a go, but we’ll have to see how useful it turns out to be. The Big Brassicas section – something of a disappointment, truth be told. Last year we grew a few novelty items just for the fun of it. One of them was the aforementioned walking stick kale. Another was the electric daisy, and the third was an allegedly highly-edible Fuschia called ‘Berry’. Electric daisies were kinda fun. The plants and flowers themselves aren’t much to write home about – straggly, thin stems with not much leaf and strange, lumpy daisy-type yellow flowers – but it’s the effect you get when you eat a flower that’s the point of growing them. It’s a bit like licking a 9 volt battery with a mouth full of popping candy. Not entirely unpleasant, unless you really hate the dentist-esque sensation of your mouth going steadily numb, but it wasn’t something that either of us were hugely enamoured with. James Wong, who champions the variety via the Sutton’s Grow For Flavour range, suggests breaking up the flowers and sprinkling them into a lime jelly for a more gentle, fizzing sensation. But I don’t think we have time to make lime jellies from scratch. And really, we just grew them so we could see the look on Jo’s Dad’s face when we made him try one. That particular moment was well worth the time and effort. The same can’t really be said, alas, for the Fuschia ‘Berry’, which you may have seen touted last year by Thompson & Morgan. We bought five plugs (they’re now selling them in packs of 10, but you probably won’t want or need that many) and four grew to a decent size. The flowers were rather lovely, in shades of deep pinkish-red and purple. But the berries, although large, were… meh. Bland and tasteless, not very juicy, hardly anything to recommend them. It could be because they were grown in pots in the greenhouse, rather than the open air and rain, or it could be because the berries just aren’t all that nice. We’ll grow on any plants that have survived the winter, but for their flower display rather than their fruit. We established and planted up the asparagus section of the plot in March and April last year. With no harvests for the first year or two – to give the crowns plenty of time to develop – we haven’t actually tasted any just yet. But we saw plenty of good, strong growth last year, and the first spears have just about broken ground this year, so things are looking good for next year’s first cropping. Lots of leafy growth in October, just before we cut back for the winter. Our plan has always been for Plot #59 to be somewhere to grow an abundance of flowers as well as edibles. Mainly as a food-lure for pollinators, but also because they’re so gosh-darn pretty. Jo is in charge of the floral department and over the past year she’s sown and grown some absolute stunners. This dwarf sunflower is a miniature star-burst at knee-height. These lupins shade from red to dusky pink, depending on the light and weather. These golden lupins really catch the sunlight. A slightly darker-than-usual shade to this common Digitalis purpurea. As discussed back in January the aim for this year is to make the entire plot as productive as possible. There’s some infrastructure work to do – the central path will finally be laid, and a seating / hard-standing area at the back, hopefully – and of course the regular rounds of maintenance, watering and weeding. But at long last, the focus will be set firmly on growing and harvesting, rather than clearing and sorting. We’ll keep you posted as things develop. Please feel free to drop in from time to time to see how we’re doing. September is a time of plenty, and no mistake. The do say a picture is worth a thousand words, but I’ll briefly walk you through the above. From the top-left: a bag of apples and plums donated by a plot-neighbour; the last of this year’s maincrop ‘pink fir apple’ potatoes, with three giant black radishes on top; (in the box) autumn raspberries and Japanese wineberries; this year’s onion harvest, cleaned and trimmed and ready for storage; the first of this year’s ‘turk’s turban’ squashes (we have another nine or ten at varying stages of size and ripeness); a few more courgettes and a smallish spaghetti squash (at least, I think it is…); another bag of fresh runner and French beans, plus an unruly head of bolted purple cauliflower / broccoli. Not too shabby, if we do say so ourselves. 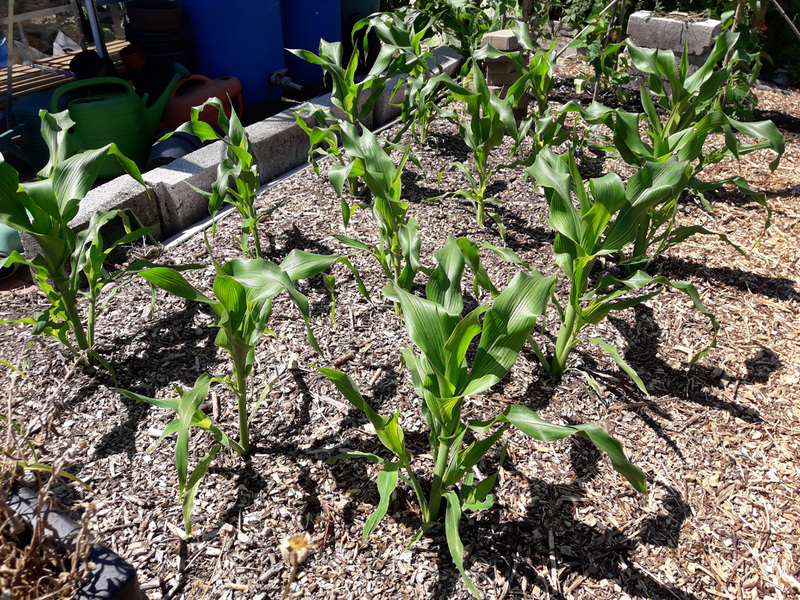 Coming soon: sweetcorn, which I’m leaving a little longer to enjoy this week’s forecast sunshine, and perhaps the first of the cabbages. Harvest Monday is a GYO meme hosted by Dave at Our Happy Acres. Lush foliage everywhere, plenty of rich pickings to be had. Down on Plot #59 we’re in full Summer-to-Autumn transition phase. All the onions and garlic have been lifted and dried. The broad beans have finished producing and have been cleared away. The peas will follow shortly. The strawberries, gooseberries and blackcurrants are long-finished, but the Autumn-fruiting raspberries are starting to fruit on a regular basis. Likewise the Japanese wineberry: from a single plant we’ve had a regular supply of sweet, tart, raspberry-like fruits with just a hing of wine-gum about them. The beans are in full flow: runners and French varieties alike. We’ve been eating them and giving them away for weeks now, and our freezer is packed to the gunnels with packets of beans for winter. It’s getting to the stage now where we’re deliberately leaving the larger pods on the plants to ripen up: we should have plenty of dried beans for winter soups and stews. Beans, beans and yet more beans… yum! Our courgettes are marching on as well. 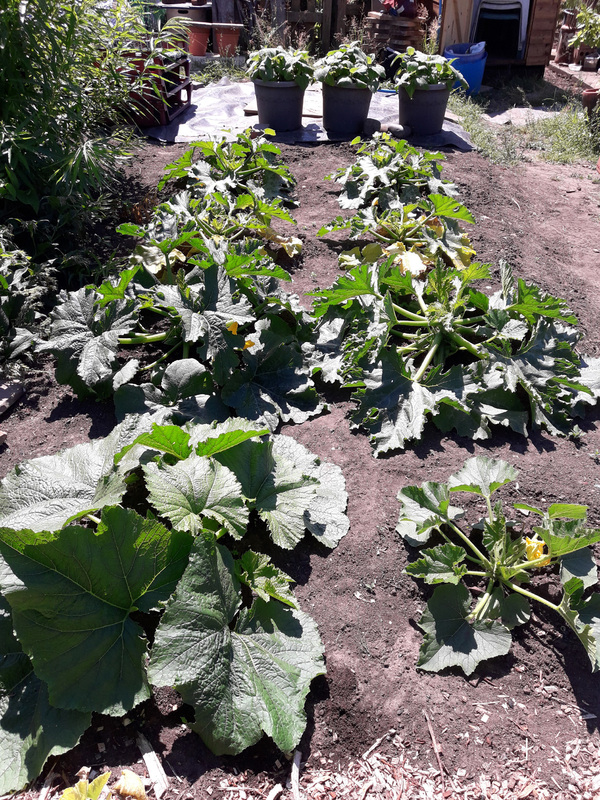 The three ‘Tondo di Piacenza’ plants each produced a full-sized fruit, so we have three large squashes maturing for use later in the year. Speaking of squashes, this is the first year we’ve grwon ‘Turk’s Turban’ and the results have been impressive: we’ve got a good dozen maturing on their vines in the ‘three sisters’ section at the front of the plot, alongside some nicely-ripening sweetcorn cobs (and yet more beans). 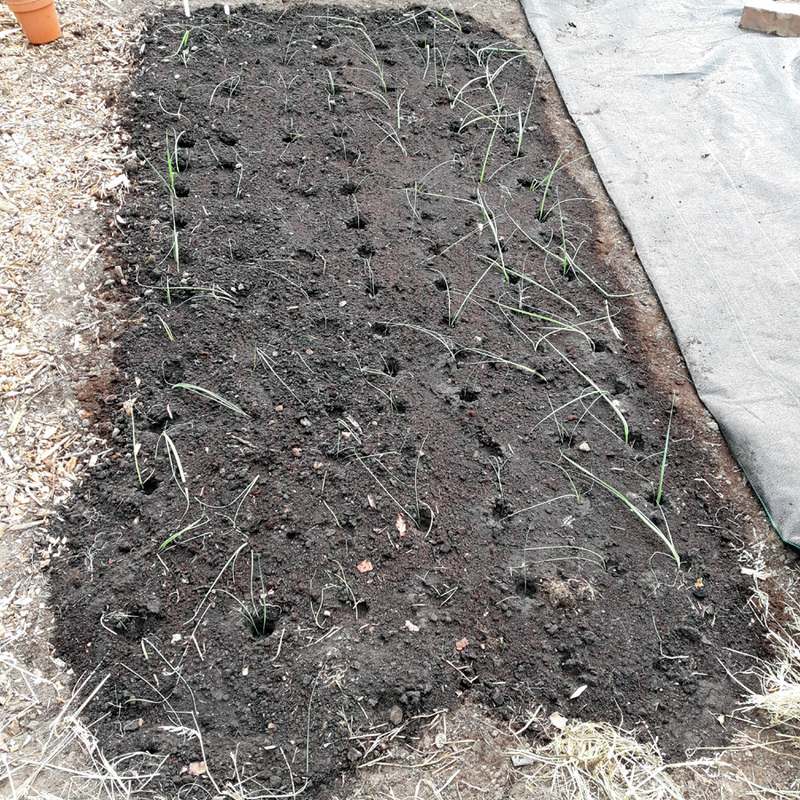 This year’s leeks have been planted out and the area nearby cleared, ready for the seed garlic which will be arriving before too long from the Garlic Farm. 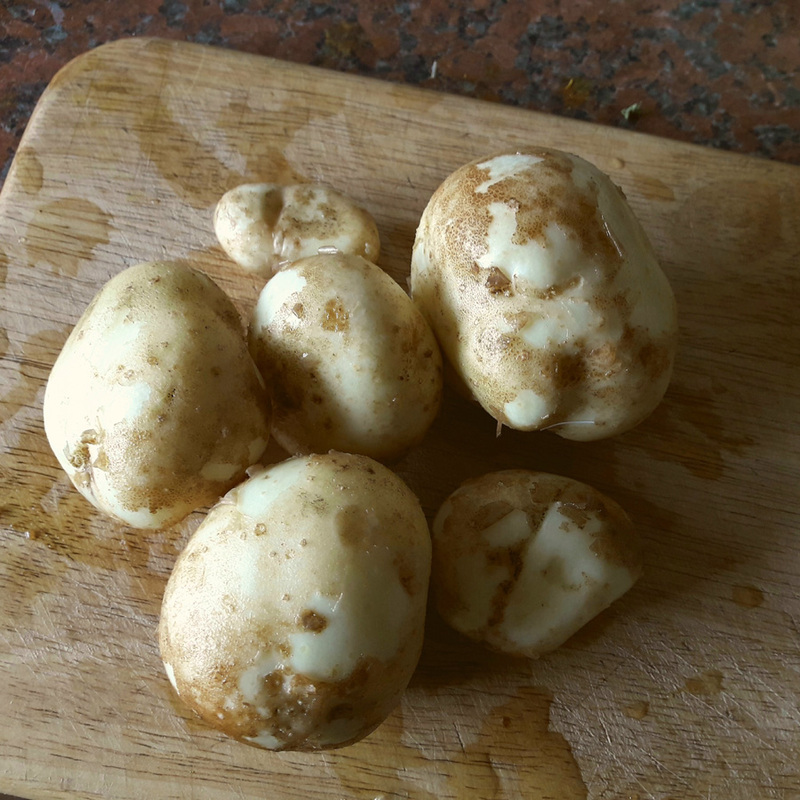 I’ve made a start on lifting the last of the blight hit second early potatoes – ‘pink fir apple’, which a couple of folks have told me is particularly blight-susceptible – and I’m happy to say that the crop has been reasonable, if not as impressive as last year. The tubers are smallish, but perfectly usable and tasty. Thankfully, taking swift action to remove the haulms seems to have kept the blight from infecting them, so they should store quite nicely. 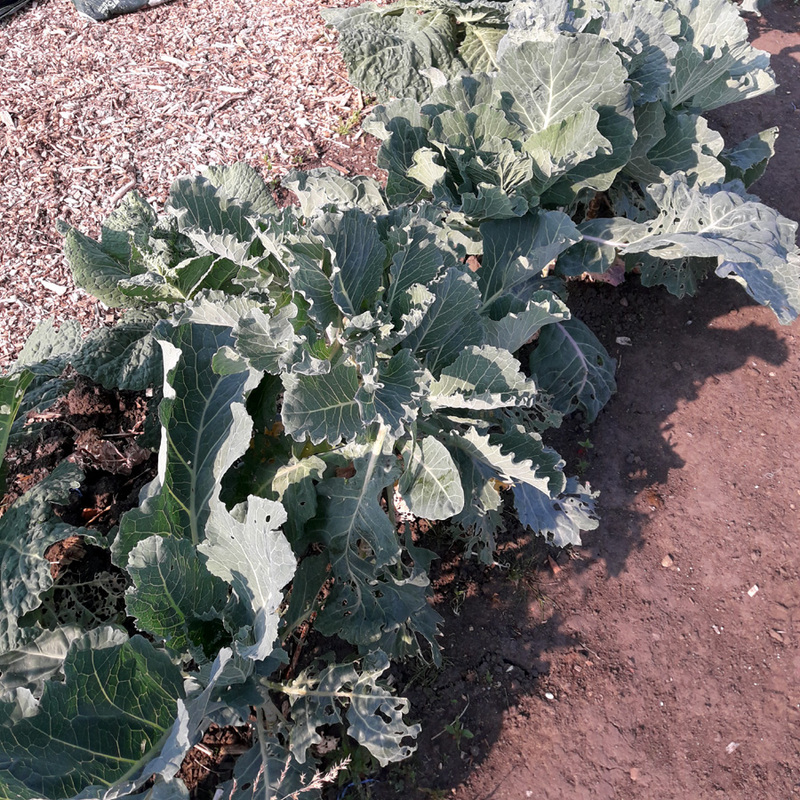 None of the cabbages are ready yet – they’ve only been in the ground since late July so there’s a chance they went in a bit too late, but we’ll see – apart from a bit of calabrese-style broccoli. Hopefully we’ll start to get some kale in September. The sprouts seem to be coming along nicely though, and we have lifted a few decent-sized turnips, and some very tasty black radishes that I sowed on a whim. Got to keep those pesky cabbage whites and diamond-back moths at bay. 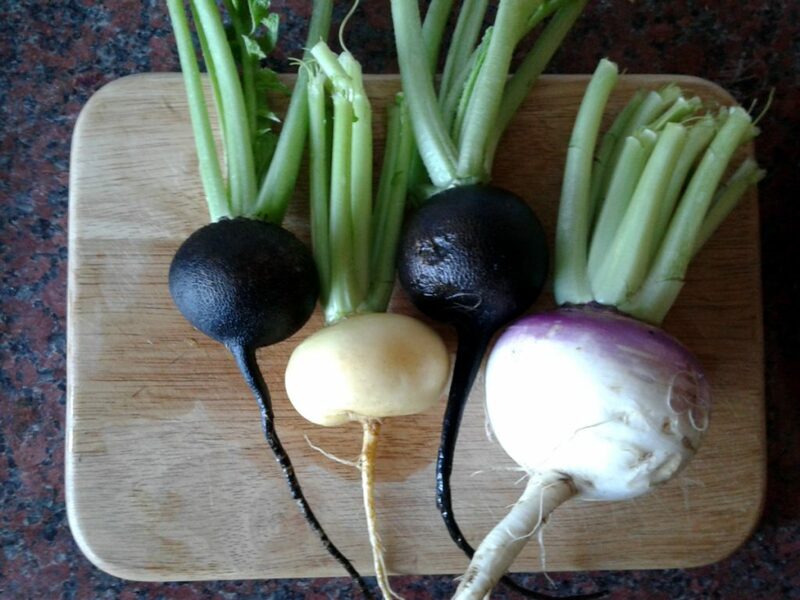 Golden and trad turnips and a couple of peppery black radish. And of course, the floral department continues to put on a good display. The sunflowers are starting to look a little ragged around the edges, but the Dahlias, Lavender, sweet peas, Tagetes, wallflowers, evening primrose and Verbena are still going strong and the Nasturtiums are everywhere. Jo has planted out a few rudbeckia, black-eyed Susan, and Zinnia as well. We’ll have a lot more flowers on show next year, when we sort out the central path and dig out flower beds either side. 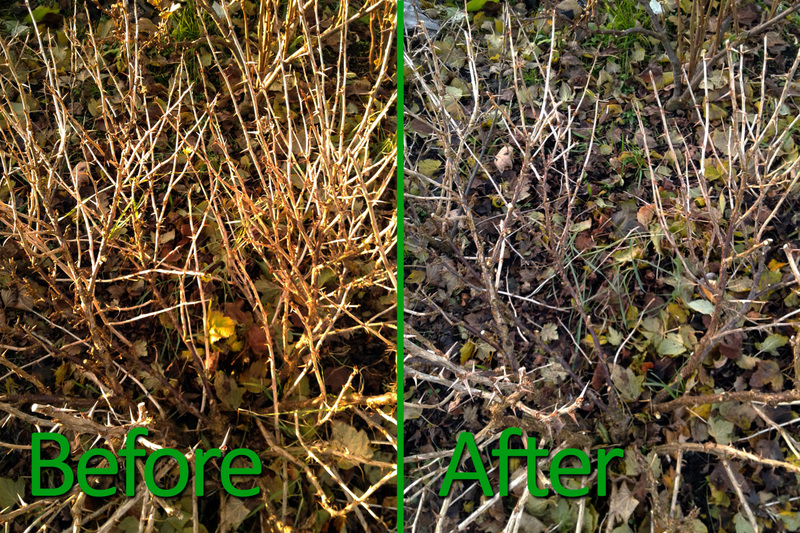 Apart from all of the above, the main work on Plot #59 has been the aforementioned weed-clearing. Unfortunately our plot-neighbour to the back moved to a new plot and his old one has been left to go to wrack and ruin, rather than taken on by new tenants. So that’s now weed-choked and is spreading seed, spores and rhizomes through to the back of ours. And another plot-neighbour hasn’t been around as much as usual (for entirely valid personal reasons), so his plot is starting to go the same way. I’d love to spend a bit of time helping him out, but to be perfectly honest there’s more than enough to do to keep our own plot in reasonable shape at the moment. I’m spending a lot of time at home digging out the first bed for our cottage garden project, so that’s keeping me from putting in the hours that I’d like to. Well, nowt for it but to do what I can, when I can: roll up my sleeves, reach for the fork and dig out the worst of the weeds, then get the covers down and try to keep the beggars at bay until we next need the ground for planting. That’s the allotmenteers way: grin and get on with it.